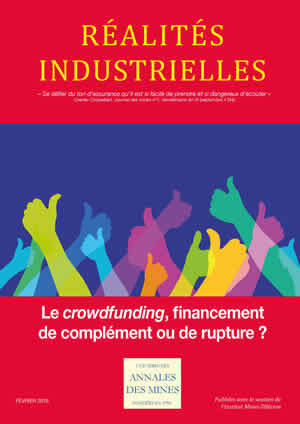 Réalités Industrielles - Février 2016 - Le crowdfunding, financement de complément ou de rupture ? February 2016 - Crowdfunding, a supplement or an alternative? Crowdfunding, a supplement or an alternative? Crowdfunding, an El Dorado for fund-raisers? French-style crowdfunding: How to raise funds successfully? What impact does crowdfunding, a product of the social media, have on finance? Crowdfunding or the crowd that lays the golden egg?